I wasn't sure whether to call this Creamy Chicken Casserole Recipe or Creamy Baked Chicken Recipe. I think Casserole sounds more warm and inviting. The curry give this casserole dish a most wonderful flavourbut the cream makes it a no-no for dieters. I havent tried substituting with low-fat alternatives so I can't make any suggestions in that area but I will ammend the recipe if something else works well. It's a bit of trial and error in my kitchen but at least you know the recipes I recommend work! Place the chicken in an ovenproof dish. Heat the butter and fry the mushroomsuntil golden. Mix with the chicken. Mix the remaining ingedients together andpour over the chicken. Mix well. Bake in a preheated oven at 180C/350F for 30 minutes. Serve with rice and a green salad. 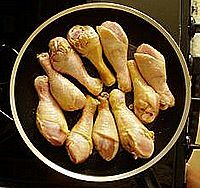 Preheat the oven to 180 degress C or 350 Degrees F. Remove the skin from the chicken legs and arrange them in a casserole dish. Wash and slice the mushrooms. Heat a little oil in a large saucepan or frying pan and gently fry the onions, garlic and mushrooms until the onion is translucent. Mix together the mushroom soup powder, cornflour, thyme and water and add to the ingredients in the frying pan. Stir this to lift up all the juices and tasty fried bits and then pour the whole lot over the chicken legs in your casserole dish. Cover the casserole and cook for 45 - 50 minutes. The casserole is ready when the chicken is done. Garnish with the chopped parsely and serve over Basmati rice.